Todays contributions come from: Australia, Austria, California, Colorado, Denmark, France, Georgia, Germany, Hong Kong, Illinois, Japan, New York, Saudi Arabia, Russia, Spain, Sweden, Switzerland and the United Kingdom. 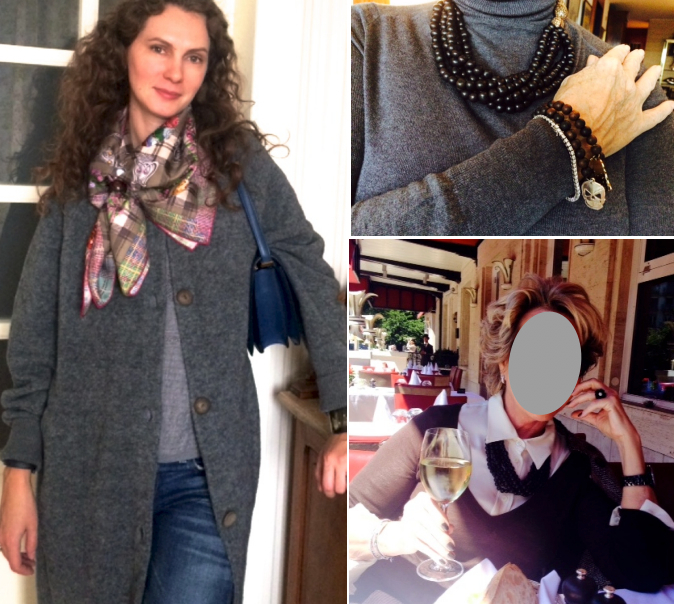 Clockwise from top left: Perla with a silk carré in a twist wrap, using a Grande Classique scarf ring. Jerrine with a 'Zebra Pegasus' 90 carré and a gemstone necklace in Vieux d'Or. Marla in the OC with a waterfall necklace in ecru, and a 'Le Bal des Oiseaux' 90 carré tied in a vertical basic slide with a Shawl ring in african horn. Still-life by Monica with a Gemstone necklace in green, a 'Costumes Civils Actuels' 90 carré and Jige pochette. 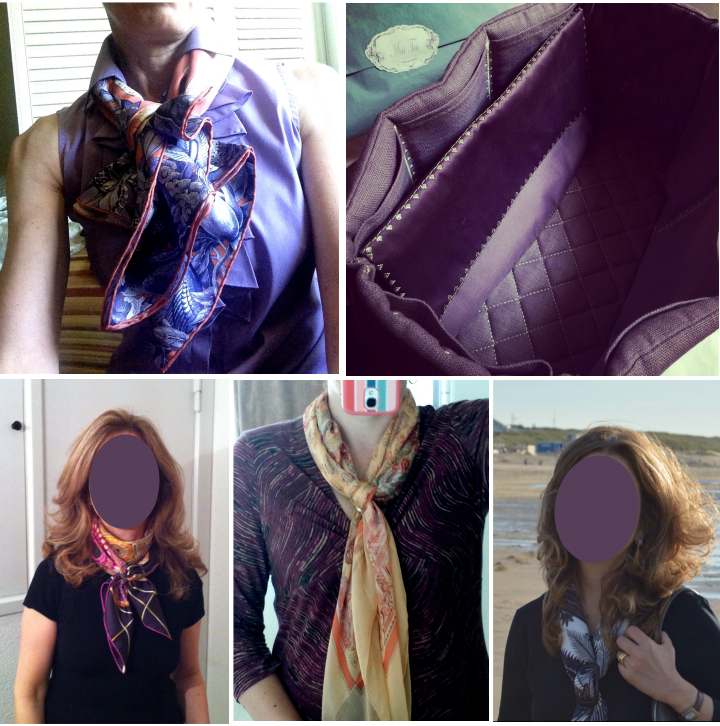 Clockwise from top left: Marla in the OC with a 'Tous les Bateaux du Monde' 90 carré in an asymmetrical wrap, ends tied with a Shawl ring in a criss-cross knot. Still-life by Emma, with a Birkin 35 organizer and a Carré Pochette in mauve brushed cotton. Manuela with a 'Mythiques Phoenix' 90 carré, tied in a vertical basic slide with a Shawl ring in black horn. 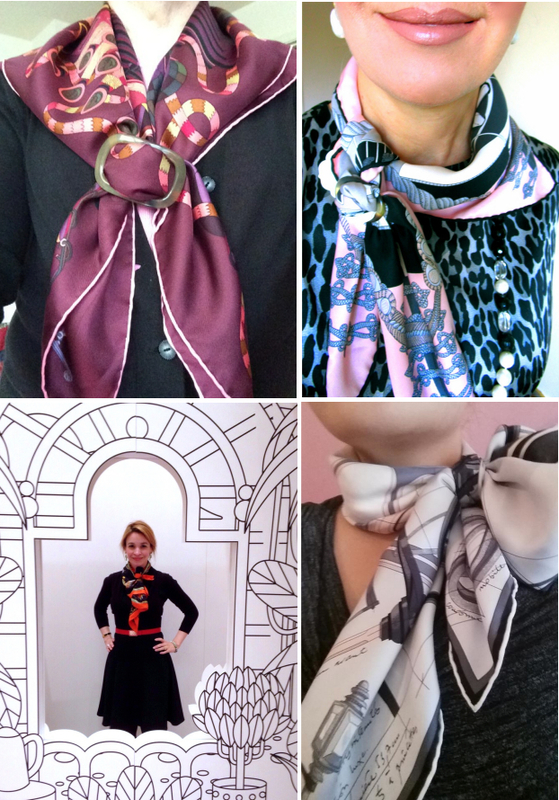 Melora with a Mousseline GM, tied into a double criss-cross knot with a Moyenne Classique scarf in Mother of Pearl. 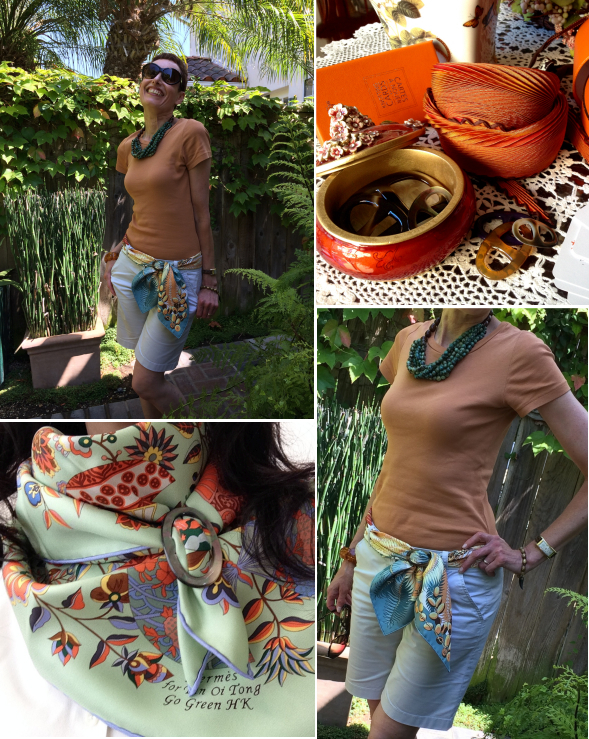 Manuela with a 'Les Domes Celestes' 90 carré tied in a basic slide (scarf wound once around the neck beforehand) with a Grande Classique scarf ring in honey horn. 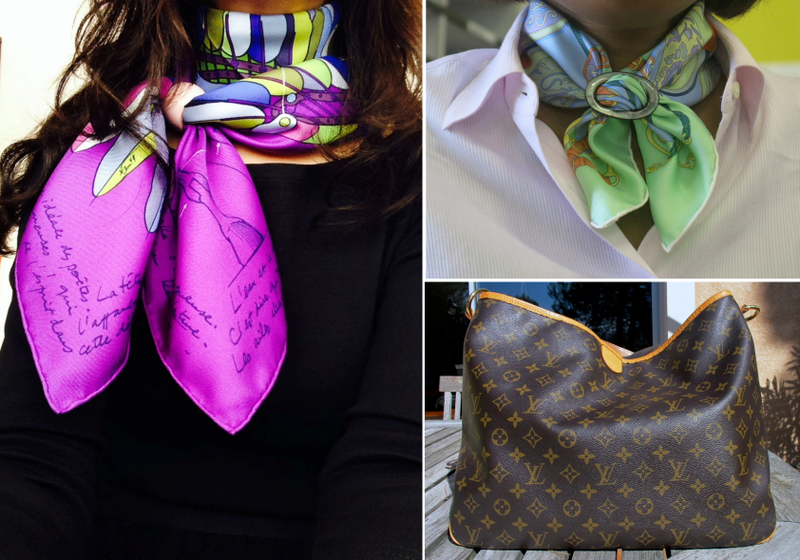 Clockwise from top left: Wanda with a 'Le voyage de Pytheas' 90 carré tied in in a criss-cross bow knot with a Classique Grande scarf ring in Mother of Pearl. 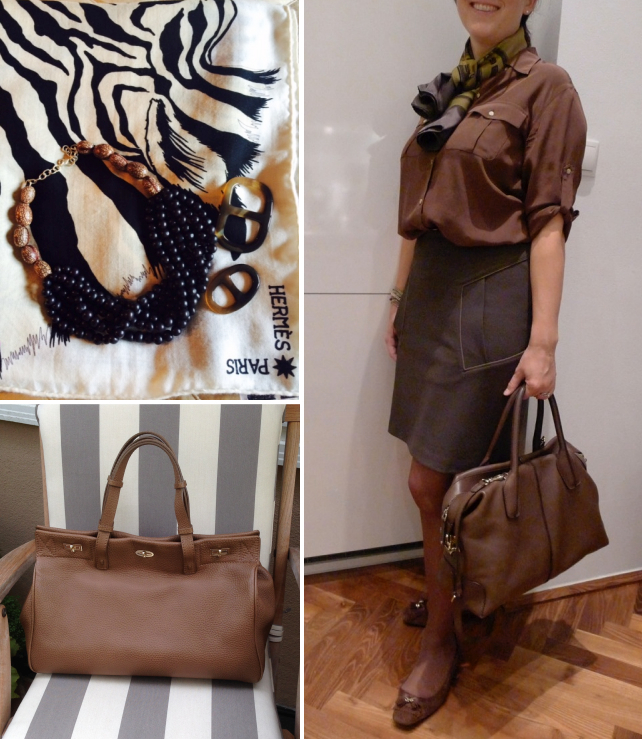 Still-life by Monica with a Gemstone necklace in green, a 'Costumes Civils Actuels' 90 carré and Jige pochette. Perla with a SAGA fox fur collar in mocca. Still-life of a lacquered Anneau Infinity in black by Marsha. 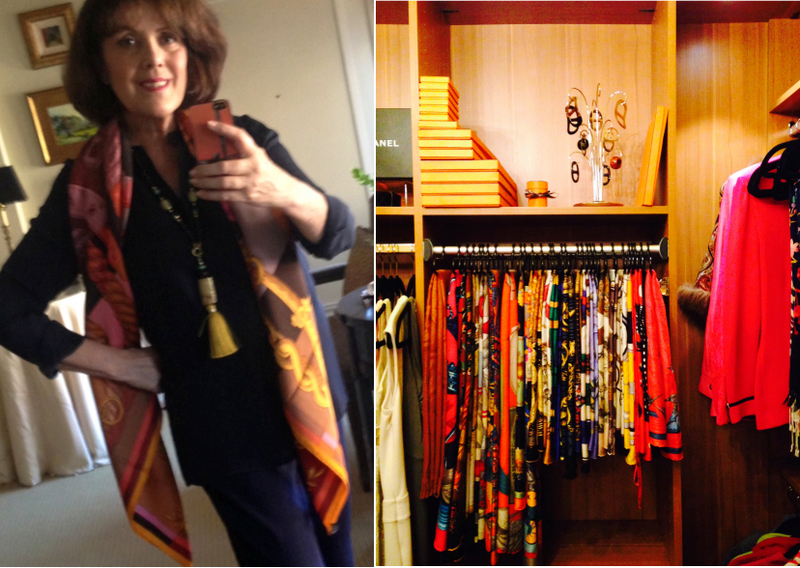 Left: Jerrine with a 'Della Cavalleria' cashmere GM and a long gemstone necklace in Vieux d'Or. Right: Elizabeth's scarf ring tree with a collection of Anneau Infinity and Classique scarf rings and Shawl rings in horn, lacquer and Mother of Pearl. 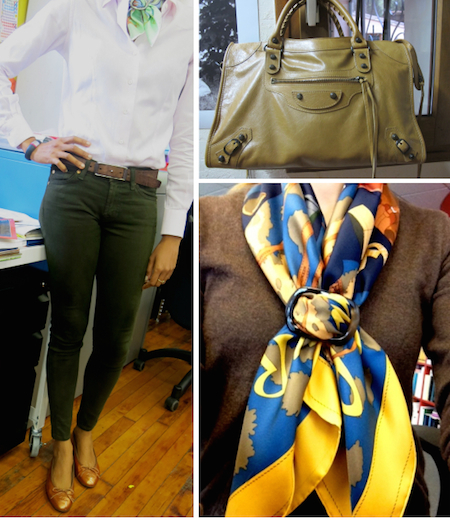 Clockwise from top left: Marla with waterfall necklace in lagoon, and a 'Mythique Phoenix' 90 carré worn as belt (secured with a Grande Classique scarf ring in the basic slide). Still-life by Perla with a collection of Classique scarf and shawl rings. Marla as before. 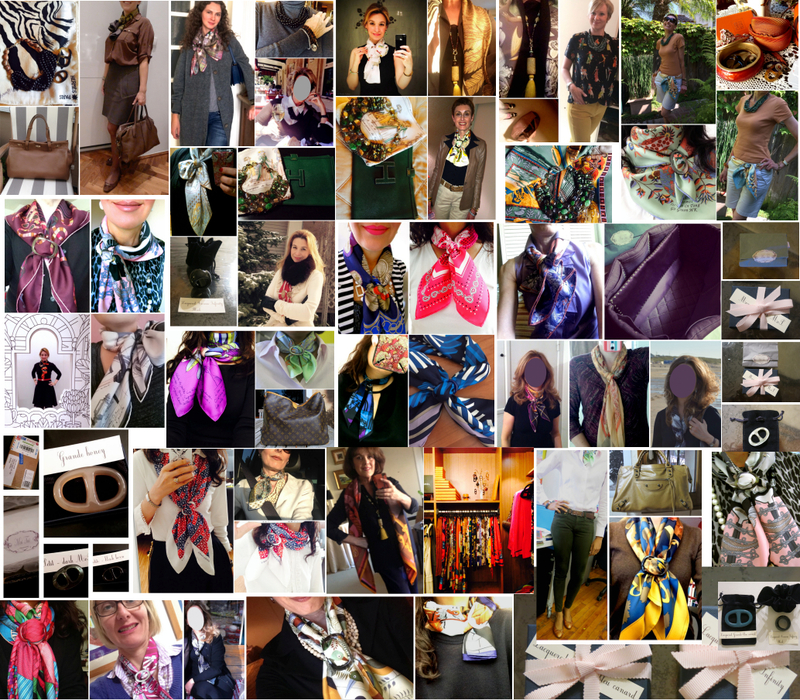 Cecilia with a 'Fleurs et Papillons de Tissus' special edition 90 carré in a cowboy knot (ends tied into a vertical basic slide with a Grande Classique horn scarf ring). 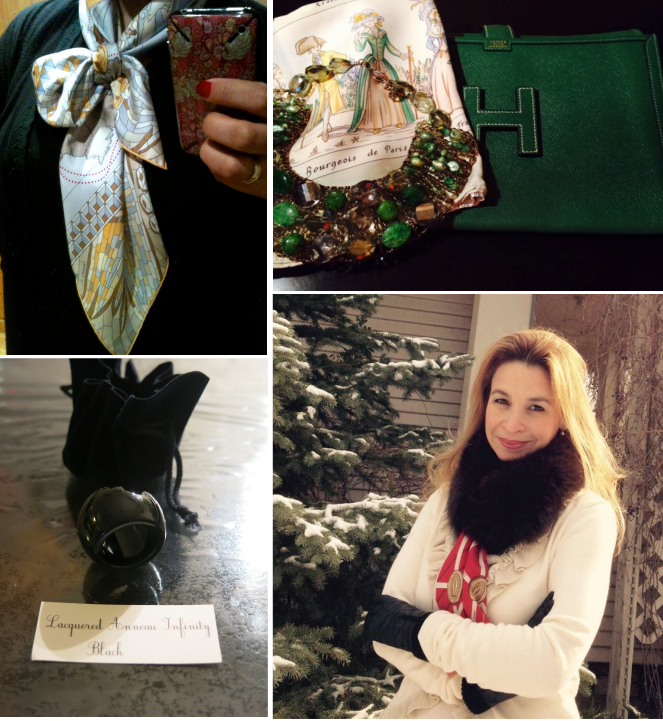 Clockwise from top left:Marsha with a 'Soie Festival Gavroche, tied in the basic slide with a Moyenne Classique scarf ring in dark Mother of Pearl. Irina with a 'Monsieur et Madame II" 90 carré tied in the basic slide with a Shawl ring in dark sunshine horn. Florence's Balenciaga 'Work' in cumin with a Birkin 35 insert in noir/naturel. 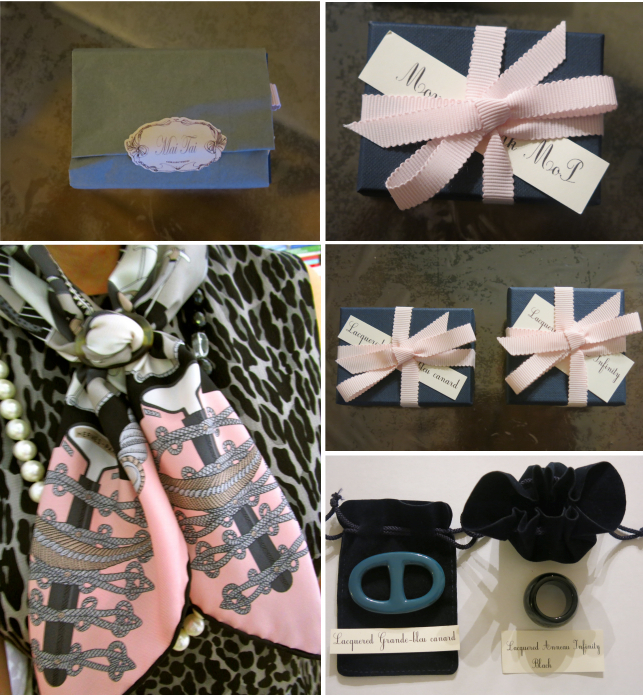 Clockwise from top left: Still lifes by Marsha: unboxing of a Moyenne Classique scarf ring in dark MoP and bleu canard lacquer, and a lacquered Anneau Infinity in black. Faux Fuchsia with a 'Circus' 70 carré, tied in the basic slide with a Moyenne Classique horn scarf ring. 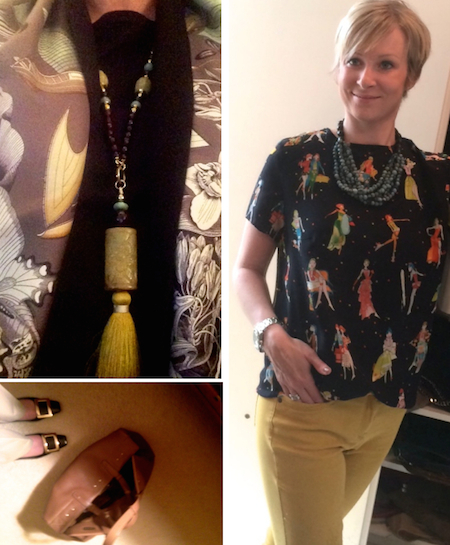 Clockwise from top left: Still life by Monica with a Waterfall necklace in black, Shawl ring in sunshine honey, a Classqiue Grande scarf ring in dark honey and a Zebra Pegasus cashmere GM. Macs with a 'Brides de Gala' 90 DipDye in a criss-cross knot (folded into a rectagle as a starting point), secured with a shawl ring. Marla in the OC's VBH Vault bag in toffee with a Birkin 35 insert in naturel. 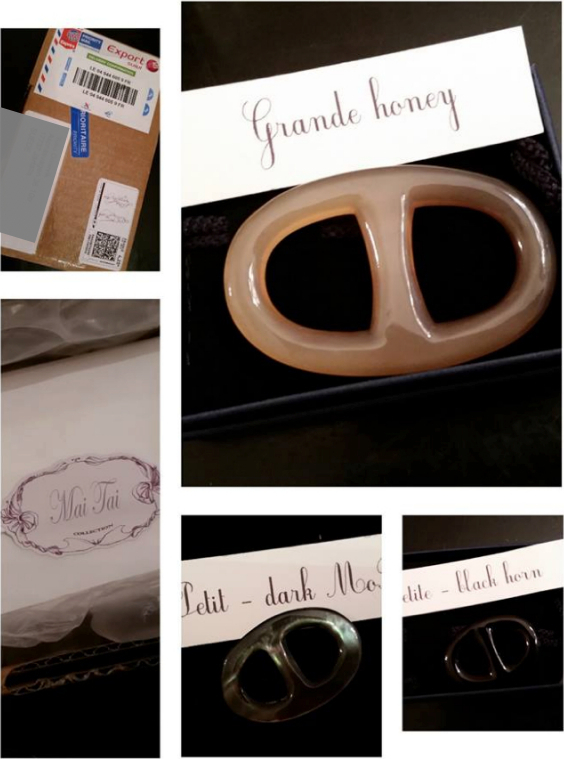 Clockwise from top left: Elaine with a 'Point Orgue' 90 Carré, folded into a triangle and ends secured with a shawl ring in the basic slide. 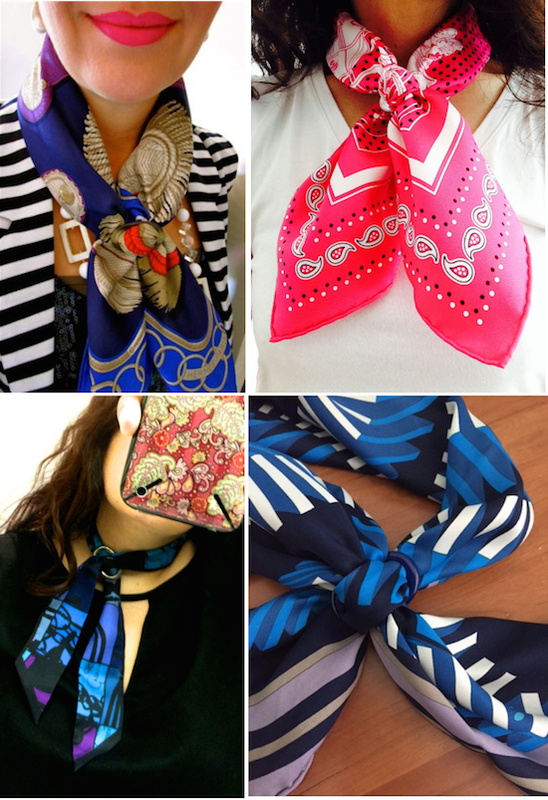 Faux Fuchsia with a 'Circus' 70 carré, tied in the basic slide with a Moyenne Classique horn scarf ring (scarf folded into a triangle as a starting point).Yoko with a 'Petit Duc' 90 carré in a criss-cross bow knot, tied with a Grande Classique horn scarf ring in honey. Perla with a 'Promenades de Paris' 70 carré tied into a Waterfall knot with a Moyenne Classique scarf ring in Mother of Pearl. Clockwise from top left: Faux Fuchsia with an 'Epaulettes' 70 carré tied in a basic slide, secured with a Classique Moyenne scarf ring in horn. 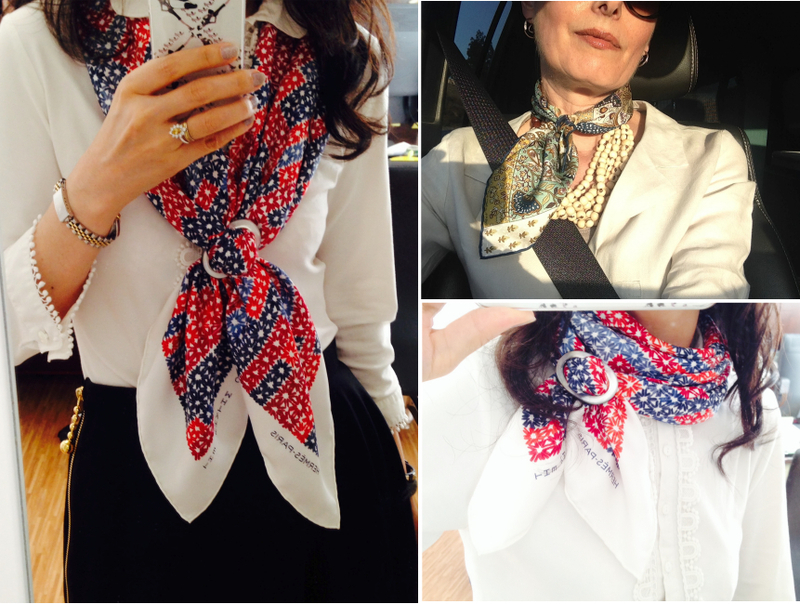 Cecilia with a 'Ex-Libris' 55cm silk bandana, tied into a criss-cross knot with a Petite Classique scarf ring in Mother of Pearl. Christel's 'L'Effet Domino' 70 carré in a criss-cross knot, tied with a lacquered Moyenne Classique scarf ring in bleu marine. 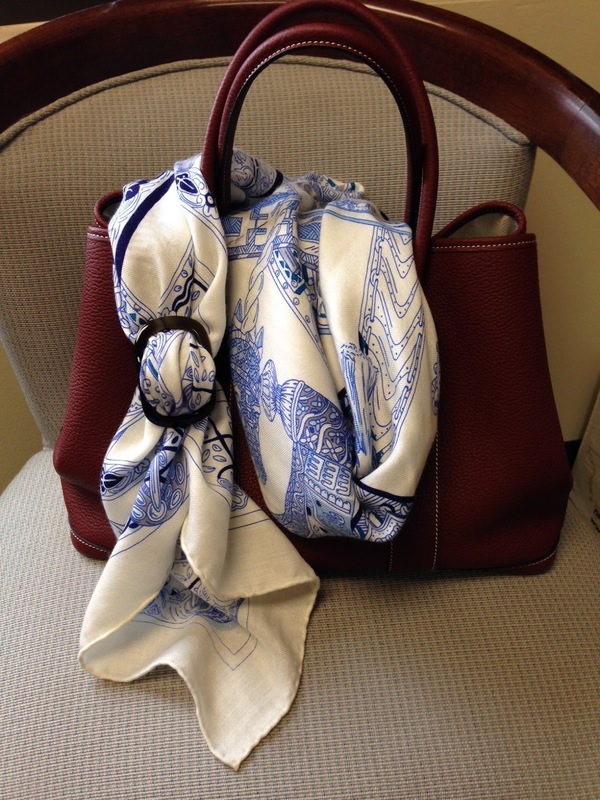 Wanda with an 'En désordre' Twilly in a criss-cross knot, secured with a Classique Moyenne horn scarf ring. Anyone who would like to participate in collage #14, please send your pictures(s) and a short note with which name/ID/nick-name you would like to be credited with to: maitaicollection@orange.fr Looking forward to your contributions!